This tool is for the advanced user who has assigned DNA segments to specific ancestors. To compare segment data for multiple (possible) relatives use one of my other tools. This program will make a pretty chromosome map from a CSV file which lists ancestral DNA segments from your known paternal and maternal ancestors, up to 20 ancestors on each side (you can have more if you specify your own colors). More about it with pictures in my August 3, 2013 blog post and more pictures, including the one to the left, in this September 2014 post. Use my other tool, the segment mapper, to make a chart of overlapping segments from relatives or other DNA matches for up to 40 possible relatives (or more if you specify the colors). And use my one chromosome mapper for a detailed look at overlaps on a single chromosome. The Chromosome Mapper requires the column headings and contents as listed below, case sensitive, in any order, in your CSV spreadsheet. It is intended as a tool for picturing your ancestral DNA as determined from known relatives as opposed to showing your DNA overlaps from unknown relatives. The most common problems are not having the correct column headings (see below) . That includes using different capitalization from the listed names. For example, someone recently used Side instead of side and the program did not understand that (yes I will add this soon). The next most common problem is not having a correctly formatted CSV file. Try using this online tool to fix your CSV – http://csvlint.io/ – or use google docs. Another problem for those who have created their own CSV files manually is that when a segment begins at the exact same location as the previous one ended, so the numbers are the same, the second segment will not be shown. Add 1 (or .1 if in millions) to the second number. Yes I think this is a bug that I should fix! Mac users creating CSV files from Numbers or other programs have line endings that my program does not see correctly. To avoid that please read the article on creating a CSV for some work arounds. To better understand the chromosome mapping concept, read the ISOGG wiki article on mapping. Also I have an article on making a spreadsheet of your chromosome matches on this blog. Once you have a spreadsheet that you want to make a picture from, that sheet has to be saved as a CSV (comma separated values) text file in order for this tool to make a chromosome map from it. MRCA Comparison or any column name you specify Most Recent Common Ancestor(s) – this is the name to use in the chromosome map picture, you can tell the program to use a different column name for this. Start Start point The starting number for the segment location used by 23andme and Family Tree DNA, in the 23andme ancestry these numbers are divided by 100,000 so check the box for decimal if you are using that style of number. End End point The ending number for the segment (see above comment). Color color colors This column is optional, you can let the tool pick the colors; but if you want different colors then put any color name from this list: http://www.html-color-names.com/color-chart.php in the color column the first time an ancestor appears in your CSV. The color name must be exact and case matters. Optionally, you can use a hex color like on the first page of this tool with a # in front of the hex digits. Warning, if you use one of the colors shown, it will also be used in order for another person, fix this by looking at the result and then specifying a different color for that person as well. Programming is how I make my living so a small donation of $5 or $10 would be most appreciated, if you find this tool useful. matches together and here it is. Have to try immediately next week. I have a mac. I use Google Docs a lot. You can save spreadsheets created there as csv as well. I just posted this on the Newbie list. Thought I should post here too. segments. You cannot do this by simply downloading a .csv file and uploading to the Tool. And this isn’t for the casual DNA genealogist. There are actually many ways the tool could be used as it allows you to label color segments and have them “plot” on a chromosome map. helpful for comparing with matches. 2) You could paint “known” segments of your 16 gg-grandparents. Basically the tool gives you the power to create graphic representations easily via a .csv file. Now the HARD PART. (And although I save match information getting this to work was not easy) First of all you must use a program that allows you to save a file in a .csv format which is basically comma delineated data. I could not find where to do that on my Open Office program (maybe EXCEL Office is easier to find) So I switched to using Mac program “Numbers” which allows you to save file in .csv. The suggestion above to Use Google docs is a great one. if you are just starting out you may not have ANY KNOWN segments thus you would have a blank Chromosome Map. versions there will be an input for chosing colors. For those of us wanting such a tool this is FANTASTIC so Thank you Kitty! But like all tools it takes some practice to be able to use it effectively and you can’t use a paint brush without paint. So if you want to use the tool you’ll have to start the painstakingly slow process of tracking matches and identifying segments. Which brings us round to the frustration of not having matching segment data at Ancestry where I have nearly 100 identified matches! I hope this helps some of you understand the genesis of the tool and how to use it. Thank you so much Kelly for explaining this so well. Awesome tool Kitty. Well done. There is a bit of a problem for those who don’t know their parentage as it won’t run if you don’t declare a p or m in the side column. Perhaps the instructions should say “If in doubt default the lot to p”?. Also an add on to your documentation for Mac users, when saving from Numbers it offers 3 format choices for the csv format It must be the windows format to make it work. Also the capitalisation and spelling on the headings must be as written exactly or it won’t play. The next release will do away with the “side” requirement by just assigning alternate sides to your data and allow you to select the colors and so include more names that way. But read what Kelly wrote above for more about the original purpose of the tool. My interest is taking a group of matches that I don’t know how they are related to me. So, I’d like to compare the chromosome matches one or more unknown matches to one or more known matches. By seeing where the unknowns are in common with the knowns, I’d infer who the common ancestor is. Perhaps in a future version, any chromosome that has overlaps from different people, the graphic would just get wider to accommodate the overlap. I do not get any results. I have exported file from 23 and me. It is accepted and when it downloads to 100%….contacting Kitty Munson. I have tried this several times. Please read Kelly’s comment above. Please check that your file is a CSV. You can do this by opening it in notepad or other text editor. If it is not plain English with many commas then it is not a CSV. I will write some documentation on creating a CSV soon since so many of you have trouble with that. It is particularly tricky on a Mac. Other users can create a CSV but then leave the side and MRCA columns blank and are surprised when the tool finds nothing to plot! Would it be possible to add one more column to the CSV file that would permit adding a note to the MRCA pop-up? This would allow me to give all segments from a particular great-grandparent the same color across my map, but then add a brief comment like “COOK/BIRDSALL” to only one of those segments (to pick one of my ancestral couples, way back in the 1600s, where I have identified a common ancestor at 23andMe), without exhausting the color palette. Because the number of centimorgans in the segment is used for display purposes only, you can put anything you want in that column. For example I put the relative’s name then a dash and the cMs. So try that for your comments. Great job. I have a suggestion. I like the (M)aternal and (P)aternal side, but it would be awesome to add an (U)nknown option. This will make a third row on each Chro. This way the unknown is not covered by the M or P. Use a gray scale or paterns. Awesome Tool, Ms. Kitty!!! Thanks so much for creating it–donation on the way! I’d really like to try this but am wondering since we are uploading our DNA to your program, does that mean that you have a copy of our DNA? I was hoping that I would be able to download the program to my computer and then upload my results. Is this possible? Jan you are not uploading your DNA to this program. Rather you upload a CSV version of your spreadsheet of segment locations of DNA from specific ancestors. This file is not kept here after being used for the display. I just released a new version of the mapper which will work without a side column by randomly assigning sides. A suggested use is to take your FIA file from DNAgedcom and sort by largest segments and then run that file in this tool. You will see your top 20 matches. First of all, thanks for this mapping tool. I feel it is going to be a valuable tool. I have two quick questions. After downloading the spreadsheet and getting the headings correct, I end up with each of my matches listed along with each chromosome they match segments on. When I find a documented connection to this person (let’s say it is Smith born 1830) do I add this MRCA to each of the chromosome matches? How do I determine which chromosome match is correct for Smith? My second question is, as I get additional matches on FTDNA FF, do I create a new spreadsheet (this overwrites all the headings etc I have prepared) or should I enter them manually? If you do not have a parent to test, then 1st and 2nd cousin tests can be extremely useful for phasing. As to whether to add an MRCA that is up to you. This is just a tool for turning data into a pretty picture of chromosomes which can be used in many different ways. Same answer for creating a new spreadsheet. If there is no additional data in your current spreadsheet then you can just paste in the new column headings on the new sheet. Column ordering does not matter to the tool. Personally I keep adding new data manually since I have much information in my current spreadsheets. I am working on a new tool now, a segment mapper, which will show up to 60 people with matching segments on five lines within each chromosome. I recently did microarray to get transcript of Agave sisalana plant and full annotated it, now i am interested on chromosome mapping can you please help me ? Having run the chromosome mapping tool, where is it to be found? If execution falls over for any reason, is there any error messages? I have improved the error reporting for the segment mapper but possibly not this chromosome mapper. The results appear on your screen. If they do not there is an error in your CSV file. Please check that it is a CSV and that all the headings are correct. I’m getting the error message, “Column heading MRCA is required. Your file is probably not a CSV file please fix it and try again.” The file is a CSV–I tried saving it as such in both Excel and TextEdit–and I do have a column with the heading “MRCA.” I checked all of the column headings for accuracy and case. I’m using a Macintosh. Got it! Saving as “Windows Comma Separated (.csv)” solved the problem. Thank you! Does anyone know if it is helpful to include the data of a sibling on this list? You might try posting this question on the ISOGG DNA_NEWBIE list at yahoo. The idea of these tools is to use them as you please. Thus the answer depends on what you are trying to do. This chromosome mapper tool is for DNA segments you have assigned to specific ancestors but of course you can use it in other ways. I use the Segment Mapper tool with my brother’s data to look at known relatives, posted here. My file used to work in the mapper tool. Updated it now it doesn’t. what could have happened? Please help. When a CSV file does not work, try looking at it in a text editor like notepad to see what might be wrong. Hi I did dna testing to find my dad. I have all this testing and I do not understand how to narrow it down to find him and his family. Do you have any ways for me to narrow down all these people to help me get to the one person I’m really looking for. thanks for any help you can give. Is there any potential to use this if my test was done through AncestryDNA? They have no chromosome browser and this seems like a beautiful solution to my problem! I sweated over it and made a csv with 40 people, and assigned all my own colors, as I read it if I did, that I could have more than 20. But when I run it — it leaves out 20 people! What am I doing wrong?? I may have only added that to the segment mapper, I will double check the code and fix it today if so. Meanwhile I will send you an email so you can send me your CSV in order for me to use it to further test this, thanks! This is amazing!!!! I’ve been trying to do something like this by hand, but it was just getting too complicated. Thank you so, so, so much!!! Worked like a charm. The error messages were most helpful. So far I have my mom’s DNA test and have phased my results at Gedmatch based on her’s. I did a very simple map showing my Gedmatch matches and whether they were on my mother’s or father’s side. It’s very helpful to see 945 lines of matches in one picture. Next I’ll add my FTDNA maternal and paternal matches based on inferred connections between FTDNA and Gedmatch and remap. Then I may map my wife’s DNA, but it would be based on her 1st cousin once removed as she hasn’t tested her parents. So her sides would be Lefevre/Pouliot vs Butler/Ellis. Her parents are Butler/Ellis and Lefevre/Pouliot are on the father’s side. A classmate of my granddaughter has a Beauregard/Lefevre ancestry. I am interested in pursuing any connection between lefevre & pouliot that may shed some light on a possible conenction between that lefevre line and my granddaughter’s pouliot line. I understand that all pouliot’s are descended from Charles Pouliot of St Cosme de Vair. Is your lefevre/pouliot information available on line? I’m building the spreadsheet required to use your Chromosome Mapper tool. Both my paternal and maternal lines are full of endogamy — how do I handle a quadruple cousin? Do I enter her data four times under the four different MRCA’s, or just once and leave the MRCA column blank, or what? So far I’ve identified 8 different cousins with MRCA’s (and no, I’m not AJ). Thanks for any guidance/suggestions and for your wonderful blogs. My tools are for you to use as you wish. The intent of the chromosome mapper is to use to may ONLY those segments you are sure of. With endogamy it may take many cousin tests to figure out which ancestor gave which segment if it can be figured out at all! I recently heard from a known 5th cousin that we share another set of ancestors so are 6th cousins as well! Now I am no longer sure which ancestor the second half of our large segment (17cM) match is from. The first half is shared with a cousin who does not share the other ancestors. I would guess the second half is from that other pair of ancestors but I will not know for sure until I find a cousin on that line only, who also has that match. Thanks for the tool I have used it in the past with success but haven’t added ancestors for a while. I am using the same spreadsheets before (I think!) so not sure what is happening . My kits don’t seems to be showing up on the right sides. I have M’s and P’s in the right places in the column ”side’. On my previous version I had headings of MATERNAL?PATERNAL. I don’t seem to have these headings now for either Maternal or paternal as they are shown in the example images. Is it something about the order in which they appear in the spreadsheet? Is this part of the changes? Is there something I can do to fix this? How do I get data for the other columns you mention? Sorry if I’m missing something very obvious. These tools are not for working with your raw data, they are for displaying your segment matche lists. This particular tool is not for the beginner as it is for when you have assigned specific segments to specific ancestors. Kelly, how can I reach you to talk private? Hi, I put the wrong name your name is Kitty? I am having a small problem with my data. I have two csv files that are almost identical. One has an extra “bogus” line added. The one with the extra bogus line maps fine, but when I take out the bogus line, one of my entries for Chr 11 does not map. It is very strange. I have checked my data and can’t seem to find an error. Any ideas? I just started using the tool and am very pleased! Remember this tool is for when you have your chromosome mapped to specific ancestors. To look at overlapping segments from possible relatives use the segment mapper tool. I am having the same problem as Veronica. Segments that I have identified as P are showing up on both the top & bottom half of the chromosome (and vice versa with M). So on the same chromosome, I have some of the paternal segments on the top half and some on the bottom half making it confusing to read. 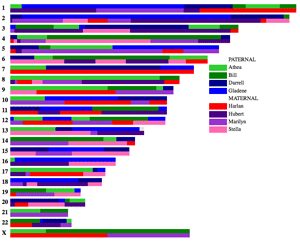 Any ideas on how I can change this so all my paternal segments are on one half and all my maternal segments are on the other half of the chromosome? Kathy, Are you sure you are using the ancestor chromosome mapper? Usually when someone has this problem they are using the segment mapper tool. It is the ancestor chromosome mapper. Veronica was using the wrong tool and that was last July. Since you are using the correct one please double check all your column headings. I sent you an email to send me the file. It is very likely something in your data since no once else is having this problem. And Kathy used the column heading Side instead of side so the tool did not think she had designated a side. I will add something under common problems. Do you know why the 23cM segment appears longer than the 29cM segment on my chromosome 8? The mapper is mapping the base pairs which is a physical distance not the centimorgans which are a probability of recombination measure. Hey there, I tested this out by creating a CSV file that includes a single DNA match but the resulting map is blank. I don’t have 23andMe and am confused by the MRCA column (why does your example show the cells with “cousin 4”, etc.?). I don’t have a CSV file to download with cousin matches but simply want to create a CSV from scratch as I come across/find matches to create a map of where my DNA on each chromosome came from. I have Ancestry DNA and use GEDMatch. So what do I put in the MRCA column? Can I just put the name of the ancestor? And why is my map coming up blank? Thank you!! This chromosome mapper tool is for when you know which ancestor gave you which bit of DNA and that is what the MRCA column is. You also need every column listed above (like side) with the exact spelling and upper/lowercase as listed. I understand how all of this works except for one thing. Let’s say I have 5 people that match on the same segment and they all form a triangulation group. I can show on paper that the common ancestor couple is John Doe and Jane White. On your map you are mapping to specific ancestor. How do I know which one of the above couple the shared segment comes from? You do not know which one of the couple that DNA is from so you show it as from the child you got it from or as from that couple. You may prefer to use the segment mapper to show the segments from that couple. I’m trying to use the ancestry mapper tool to display my visual phasing grandparent’s results. I put the first 2 chromosomes in a csv file to test it out but I get a blank map. I used the csv lint and it checked out okay. I used apple numbers saved as a csv and also excel saved as csv, same results. Please double check your column headings that they match the above. Computers care about upper and lower case and silly things like that. I will email you so you can send me the file if you still need help. Love it! Thank you so much for sharing. I had started doing graphs using a “Numbers” spread sheet. I couldn’t figure out how to get the segments to start and stop, so I was adding each segment and the graph manually. Arg! this is great i like it! Thank you so much for sharing. I had started doing graphs using a “Numbers” spread sheet. I couldn’t figure out how to get the segments to start and stop, so I was adding each segment and the graph manually. My great great grand mother was sent here from England because she was pregnant. My great grand father was born on a ship on his way to America. He was adopted. How can I find out his blood line? He still has 3 living grandchildren in their 90s.